Just last month, Danilo Medina, the President of the Dominican Republic, deployed the military into the streets to quell riots sparked by dumped ballots and allegations of electronic fraud during the May elections, which saw him re-elected with an unprecedented majority. Something unprecedented happened, and the entire political opposition, from Marxists to fascists, came together to present evidence at the Organization of American States that Mr. Medina had systematically rigged the electoral process to favor his ruling Dominican Liberation Party, which has dominated the Dominican Republic for most of this century. Despite the evidence presented to the Organization of American States, Mr. Medina has made few concessions to his opponents, and just recently members of his party introduced a law into Congress which threatens to seriously curtail freedom of religion, even going so far as banning the use of the flag during religious ceremonies, and preventing religious leaders from criticizing international treaties, especially as rumors ramp up of a treaty with the United States that will see US military personnel enjoy immunity during the course of their activities on Dominican soil. 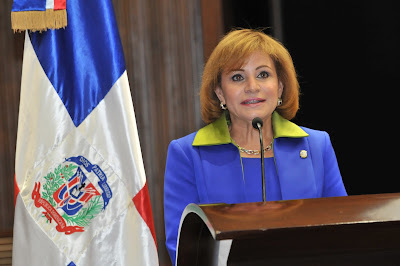 Although the new law has already caused pandemonium among religious figures in the Dominican Republic, Mr. Medina appointing his sister to head the House of Representatives will mean that the religious control law will likely pass, and it promises to be the first of many conveniently suiting the interests of the US Embassy, whose current resident ambassador is a married homosexual that previously demanded an apology from religious figures who questioned his ultimate agenda; but now those religious figures will be hampered from criticizing the US ambassador under threat of being fined 20 months salary. Josefina Arvelo, coordinator for Participacion Ciudadana, a non-partisan civic organization, told the daily 7dias that Mr. Medina appointing Lucia Medina to preside over the House of Representatives showed a serious "lack of ethics." Ms. Arvelo argued: "Although it is not illegal for the President of the Republic and the President of the House of Representatives to be siblings, it is an ethical problem because Congress controls the President's purse." In recent months, the Dominican government has come under criticism for wasteful spending, with major projects being undertaken all throughout the country which threaten to displace primarily working class individuals. Many people being displaced by major projects complain that the courts often fail to hear them, with Ms. Arvelo explaining that the Dominican Liberation Party is also in firm control of the courts. Namphi Rodriguez, a constitutional lawyer, argued that Ms. Medina's appointment in Congress represents a marked rise in nepotism in the Dominican Republic, with the threat of a constitutional dynasty taking hold of the island. Mr. Rodriguez fears that Ms. Medina's rise to power signals the possibility that the Dominican people could find themselves under a rule similar to that enjoyed by neighboring Haiti in the 20th century under the Duvalier family, where extrajudicial murder was the rule of law.